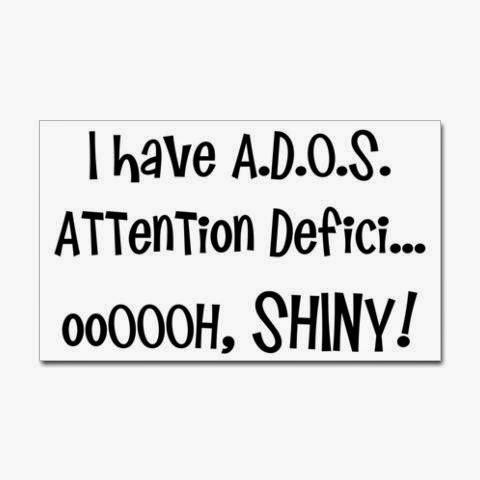 My husband has often accused me of having "Shiny" Syndrome. The more appropriate medical terminology is Attention Deficit/Hyperactivity Disorder, or ADHD. The "hyperactive" part of my condition manifests in my extremely active brain rather than the rest of my body. I often catch myself jumping from one activity to the next as my mind flickers with a new idea, tempting me to run off and play with it. As a creative person, this is fine. I'm always full of ideas. However, I can find it challenging to focus long enough to complete an activity to its reasonable conclusion. One of the ways I've learned to manage this lack of focus is with the use of a timer. I will set a timer for writing, for household chores, for virtually anything that requires my undivided attention. I will vary the allotted time depending on what I am working on, what sort of deadline I may be facing, or how I am feeling on a particular day. If I know I'm having one of THOSE days, then I use shorter times, telling myself that I can do anything for 15 minutes, 5 minutes, or yes - sometimes even 1 minute. The One Minute Writer: This blogspot site offers a daily writing prompt and a 60-second countdown to push you to write quickly without too much thinking. You can also share your daily short writing pieces with others in comments on each prompt. Write or Die 2: Despite its harsh name, Write or Die won't kill you. It will just "punish" or "reward" you based on how you choose to set it up. The version I've linked to here is the downloadable newer version with far more features than the web-based (free) version (which can be found HERE.) You can set a word count goal, a time limit, or a speed goal (wpm). The "die" part is set up so that if you choose, the program will erase everything you have written if you don't achieve the goal you've set for yourself. Granted, these are not necessarily "poetry" sites, but I find that the time I spend free writing is often the springboard where some of my better poem ideas will surface. Only 18 days until the poetry extravaganza we call OctPoWriMo will begin! I have used both of these resources in the past. Thank you for the reminder! I've used Write or Die, but I didn't realize there was a 2. Cool, I'll check it out.